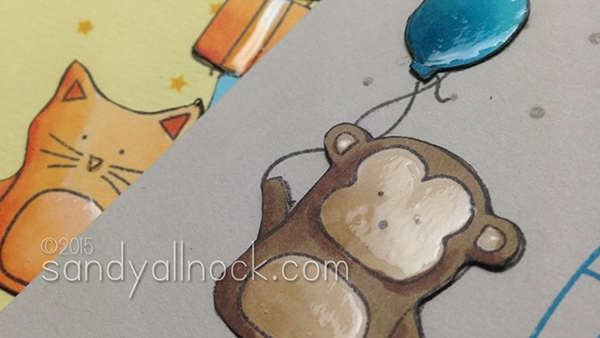 My project is actually four cards – when I first ink up a new stamp set I like to try it all out! I’ve stamped the four Falling Backgrounds on these, then added the four Party Animals . I pulled out all the stops and used lots of fun things to make these cards! Watch it below or click HERE to check it out in HD on YouTube. 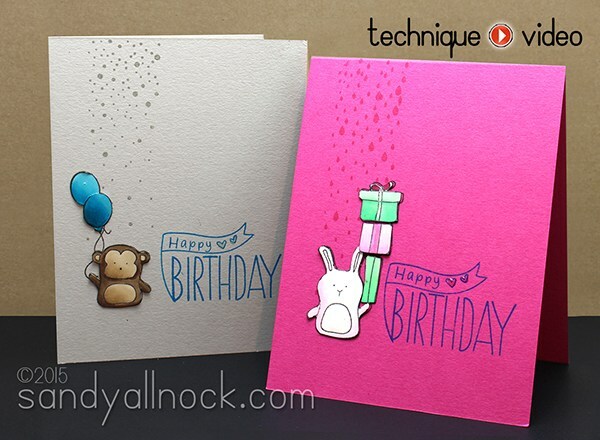 I may have used a lot of products to create these stamped birthday cards that could be considered CAS (Clean and Simple…though Simple here may be a misnomer!) but they took less time than you might think. Mass producing the stamping the way I showed with the MISTI, and stamping the masks on the post it tape at the same time as the other stamping, totally saved me time. 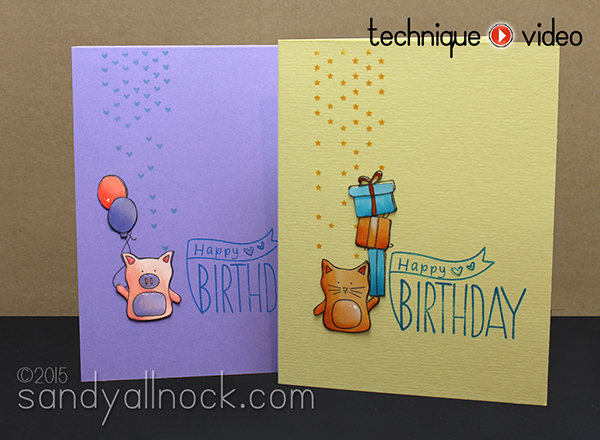 I love the little shine that the Glossy Accents leaves on some of the elements of the stamped images! This bottle nib makes it so easy to control the amount of detail you can get – the nib is sooooo teeny, and all you do is pop out the existing nib on the GA and screw on the new one. Perfect fit! In the video I promised I would show the bonus card I made using the masks I stamped on masking tape – I stamped the front-most images first, then put their mask on, stamped the next one behind it, etc. Then I watercolored them all with paints. I’ve been into this kittywompus type of card lately – just putting a panel on straight seems so…predictable. This one might just seem a little…crooked. Instead of intentional. Whatcha think? I love watching your videos Sandy. You really her my creative juices flowing. Fabulous cards. The cards are all so cute!!! This may sound silly, but I liked that you colored the animals tummies as everyone else has been leaving them white. It seemed like a missed opportunity. Oh my! these are simply adorable. My wish list is getting longer. Ahhh, how cute. My favorite is the card with all the animals. Love your blog, and wanted to say thanks so much for all the tutorials. I thoroughly enjoy watching your videos. I’m a little like you – I can’t rest until I’ve inked up all the little stamps in a set. Thanks for sharing these lovely cards! super cute! fantastic release, TFS! They’re party animals! I love the lastcard! So much fun and now you have a quick set of bday cards! 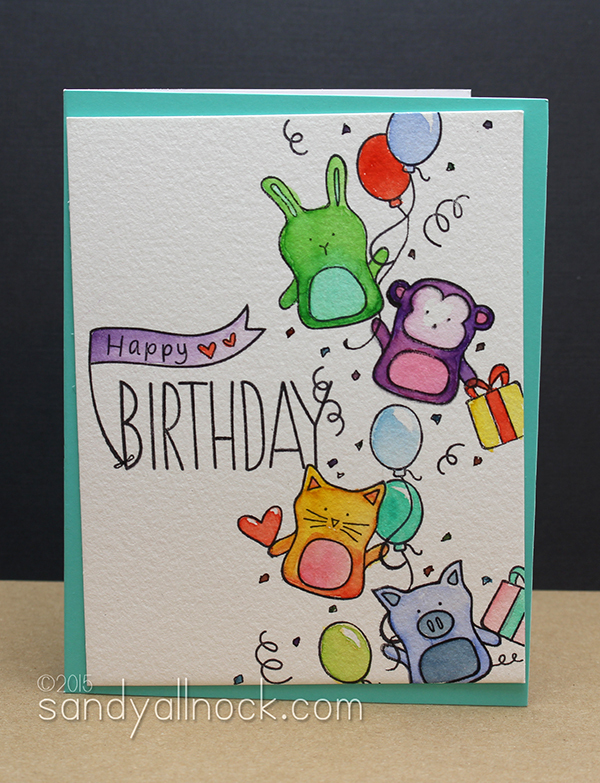 Great use of that small falling backgrounds stamps – thanks for the inspiration! Love your cards they are so cute! I need to try more layered stamping I love the look. Thanks for all the inspirational videos!! Amazing ideas with SSS new release. Too many great items to choose from. Thanks for much for the wonderful b’day cards; your friend will be very happy with them. FUN IDEAS!!!! Thank you for sharing, I just subscribed to your site! These cards ooze Party!! Love the confetti nature of them! Love the animals with the balloons floating to the top. So beautiful! That monkey is just too cute! And thanks for the tip about the nib for glossy accents! Oh my these are adorable cards. Thanks for sharing. Adorable! Love the baby party animals! I adore the last card, really a ‘party animal’ card!! Great way to mass produce cards so pretty!!!! Love the colors in,the last card, they just pop! Awesome card and video! Lovin’ this release! Great cards! Love the colors you used! So cute! Those party animals are definitely on my wish list!